The mania in crypto-currencies has been an extremely interesting case study for asset pricing and human behaviour. Since I do not see how investments in them can pass any version of a prudent investor rule, I do not comment on their price action. However, there is one area that falls under what I term bond market economics: is there any reason to modify developed country central bank rate forecasts, or our GDP forecasts, as a result of the rise (and potential fall) of crypto-currencies? My bias is that they remain economically insignificant, but we need to keep in mind that there are many aspects of crypto-currencies that are growing at an exponential (or hyper-exponential) rate. The mania might get big enough to matter, so I want to outline what I believe is worth watching (and what to ignore). One immediate disclaimer is that I discuss the macro fallout of a potential crypto-currency collapse for developed countries. I am not arguing that any collapse must happen, nor that crypto-currencies will completely disappear. Since I see limited impact of a crypto-currency collapse, I am obviously not concerned if collapse is avoided. Furthermore, there will be micro effects for some economic sectors, and possibly at the macro level for some developing countries. Those effects are not of interest to me, but they certainly matter for some readers and investors. The second disclaimer is that since I do not believe that there are serious risks, I see little need to dig into every detail of a risk scenario. For an alarmist, that might appear unsatisfactory. However, there is a bias to treat anyone calling for a disaster scenario as being serious, when in fact being an economic perma-bear probably poses more risk to investors. It is very easy to wallow in financial crisis scare-mongering in the aftermath of the Financial Crisis, and sit in a low-risk portfolio for an extended period. However, such a view is just being a government bond perma-bull, and could theoretically be as delusional as internet stock analysts were. If you are long duration, your risk scenario is everything turning out hunky-dory. I wrote a series of three articles on Bitcoin valuation, which details some of my thinking about crypto-currencies. Part I (What valuation techniques do not work). Part II(a) Initial discussion of what might work. Part II(b) Details on what I think works; probably the most important of the three parts. Since there are a few channels by which the crypto-currencies interact with the real economy, I discuss each in turn. Since I am somewhat unconcerned by the effects of a collapse, I am not concerned with weaving a single narrative of disaster. One of the subtexts of my valuation arguments in Part II(b) of my valuation article is that the crypto-currency phenomenon is closely tied to the (information) technology sector. It is hard to see the valuations of crypto-currencies remaining at high levels if the technology industry gets hit in a similar fashion as was seen during the late 1990s, or if there is a crisis that freezes up risk asset markets (as in 2008). In such a scenario of simultaneous collapse, it would probably be very easy to draw a link between the assumed collapse of crypto-currencies and the wider crisis. Since I am effectively arguing that "crypto is contained" (for now), this leaves me open to the "I told you so" argument if a crisis indeed occurs. Although I have an electrical engineering degree, I am singularly unimpressed by modern Silicon Valley, and I do not follow the sector. There is a fair amount of firms with ridiculous valuations in the technology sector, and so a crash in tech assets is always possible. The reader will have to find another source to judge the magnitude of such risks. It is completely unsurprising that exchanges have been the weak link for crypto-currencies. Although enthusiasts highlight the lack of trust required in on-chain transactions, one has to apply a lot of trust when using most crypto-exchanges. The problem is that most crypto-currencies have a rather pathetic speed of transaction clearing. In order to support activity that looks like a financial exchange, crypto-currency transactions occur off the blockchain. The implication is that until investors take control of either fiat currency proceeds or the crypto-currency is transferred to a wallet, they are unsecured creditors of the exchange. This is exactly the same risk exposure one has when dealing with a bucket shop, a type of practice for which there is a lot of practical experience. No self-respecting credit analyst would allow for transactions on those terms, particularly as the exchanges are outside regulation, and it looks impossible to seize most exchange assets in a liquidation. In addition to the trust issues associated with exchanges, they are a centralised point where fiat currency is exchanged for crypto-currencies. Given that the stated objective of most crypto-currencies is to evade bank regulations, it would be unsurprising if regulators shut them down in a coordinated sweep. They might survive in more permissive jurisdictions, but those jurisdictions could then be cut off from the global financial system. This does not mean that crypto-currencies will disappear; they will revert to trading on decentralised exchanges that are not easily blocked. However, it is unclear whether they can survive as anything other than a cottage industry. The energy bill probably has to be paid in fiat currency, and it will be a difficult transition from the current concentrated "miner" structure to a decentralised one. (I discuss energy issues in the next section.) Even if the system is highly decentralised, converting electronic currency to fiat currency -- essentially, money laundering from the perspective of the authorities -- will be difficult. In any event, such an outcome would be highly awkward for anyone who is counting on crypto-currency assets to fund their retirement. From the perspective of economic analysis for the developed countries, such an outcome is equivalent to a complete collapse of crypto-currency prices, a topic that is returned to later. The energy use of Bitcoin is a subject that has caught a lot of attention. Most commentary treats the subject like a Bitcoin supporter would: energy use is a technical issue, and can be solved by technical means. However, it appears that the growth is in fact a predictable coordination failure, a possibility that everyone except libertarians are well aware of. I refer to miners in this section. This is the cutesy term (designed to make Bitcoin sound like digital gold) for the entities that process the blocks of the blockchain. The first to solve a cryptographic computation problem gets a new Bitcoin, as well transaction fees for the transactions in the block. The key point to note is that they are paid in Bitcoin, and the payout is a combination of a new coin and user fees. As a technical note, not all crypto-currencies are as energy-intensive as Bitcoin; they use a different mechanism for miners to validate blocks in the blockchain -- proof of stake, rather than proof of work. It is possible that either Bitcoin will evolve in that direction, or it could be replaced by a less energy-intensive crypto-currency. Based on my arguments here, such a step seems inevitable. However, until then, we should expect steadily increasing energy use, which creates a footprint in the real economy. The current structure of Bitcoin mining features a rather steady payout structure. The difficulty of calculations is adjusted every 2016 blocks, and is based on the computing power displayed in the previous set of 2016 blocks. The idea is that the number of blocks added is steady over time, regardless of the amount of computing power thrown at the problem. Furthermore, the system has to be able to survive a spike in energy prices. If the transaction payment were fixed in fiat currency terms, it could easily become wildly uneconomic to mine. A major retrenchment of capacity would make it easy for a surviving miner to get 51% of mining capacity. Therefore, the high historical growth of energy use in Bitcoin mining might be viewed as a vote of confidence in the crypto-currency. The problem instead is the ability to stop the growth. All one needs to do to add capacity is to get your hands on the computing hardware, and have access to a good internet connection, and cheap electricity. If your equipment is more modern, and you get a more competitive price for electricity, your new capacity will be more efficient than existing capacity. Therefore, it is almost always profitable to add new capacity (assuming the availability of electricity). On the other side, once capacity is put in place, the best option tends to run it as hot as possible. Your equipment is a depreciating sunk cost, and so if you can cover electricity costs, there is little incentive to throttle back. On top of this, the mining capacity appears to be largely owned by tech investors. The modus operandi of tech investors is to eat negative cash flow with the objective of achieving monopoly or oligopoly status. Therefore, it should not be a surprise if existing capacity is run on a negative cash flow basis solely with the objective of driving smaller players out of the market. Therefore, the current situation is exactly where the large miners want it to be. The complexity has reached a level that kids in the basement (using their parents' electricity) are no longer a force in Bitcoin mining. Since miners largely determine the direction of development, miners will not want to cede power to competitors by voluntarily cutting capacity. However, as noted in my valuation articles, this creates a fiat currency drain on the Bitcoin economy -- electricity and internet bills have to be paid, and equipment paid for. Sooner or later, fiat currency resources will be exhausted, and Bitcoin has to be sold to new entrants to pay the mining bill. This creates the possibility of a feedback loop of a falling Bitcoin exchange rate (versus fiat currencies), rising transaction costs, and an increased risk of a 51% attack if only some players exit the mining market. This creates a whipsaw risk for energy use. We should expect energy use to rise under the assumption of no crisis, although the growth of energy use will probably slow (the miners need to find utilities with spare capacity). If this cycle follows the pattern of previous ones, we will eventually see energy prices work higher as excess capacity in production is worked through, and demand rises. Given that energy price spikes are often associated with the end of global expansions, we could have a messy situation as seen in 2008. For other consumers of electricity, the demise of crypto mining would be beneficial. The reduction in competing demand creates space for other uses for the energy. In summary, a collapse in mining demand for energy would accentuate the deflationary impact of the backside of an energy spike, but it will not matter if the global economy is otherwise expanding. Another direct channel for an effect on the economy is the purchase of computing equipment by miners (and other entities like exchanges). Although the most efficient means of doing the computations is now on specialised hardware, there is apparently still widespread usage of graphics chips (GPUs). As a result, gaming rigs are apparently quite expensive. That said, it is unclear that this effect is showing up much outside that niche. 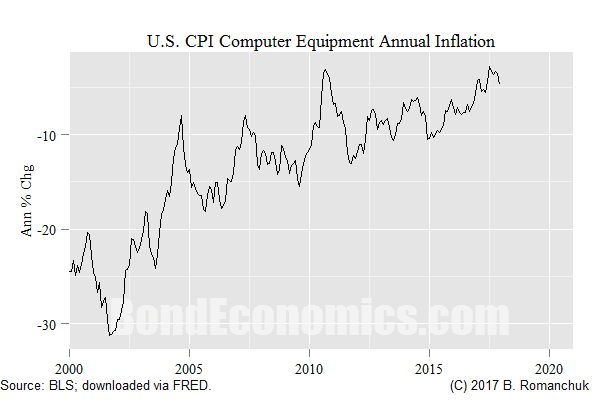 Although I have some reservations about the methodology used, the chart above shows the personal computer and peripheral equipment component of the CPI in the United States. Although one might argue that the measured rate of deflation is lower than past history, there is no obvious sign of overheating due to shortages across a wider range of products. The actual fixed investment flows may appear large, but do not appear to be significant when we realise that they are global in scope. A curtailment of investment spending may have a local or sectoral impact, but it is unlikely to be enough to move the dial on global growth (one way or another). I would use a simple rule-of-thumb to determine whether there are credit risks posed by a collapse in crypto-currencies: are there associated debts that have appeared in the bond market, either as straight bond issues, or securitisations? I am not in touch with the deal flow, so I cannot give a definitive answer, but I have seen nothing that would scare me. This criterion is not as arbitrary as it might appear. There is a lot of amateur analysis of banking system operations on the internet (and even in market research). We need to follow the footsteps of Hyman Minsky and understand the current institutional structure, and not rely on historical events or thought experiments to understand what is happening. In the current environment, the formal banking system faces a systematic loss of assets to the non-bank financial sector (sometimes called shadow banks). If banks face large borrowing flows from a sector, they have little choice but to dump the risk and the financing flows onto the shadow banking system. That means that there will be assets making their way into bond and money market funds. In the absence of such securitisation, the flows are presumably small enough to be handled by the formal banking system. It should be noted that the formal banking system in most developed countries (excluding outliers like Iceland, and the euro periphery) was not the source of instability in the financial crisis, it was the non-bank financial system. (Admittedly, the formal banks nearly blew themselves up by bringing off-balance sheet vehicles back onto their balance sheets.) Post-Financial Crisis that indiscriminately labels everyone in the financial sector as "bankers" did not help people's understanding. In any event, the lack of mark-to-market accounting makes formal banks able to weather small credit hiccups. For example, take the anecdotes about people taking a second mortgage to buy crypto-currencies. From the bank's point of view, this is not particularly exceptional. They have three lines of defense. The cash flows from the borrower's wage and salary. If the bank is well run, this is the criterion that matters. The property that is mortgaged. The crypto assets, which any well-run bank would assign a $0 recovery value to, given the difficulty of seizure. People take second mortgages all the time for any number of dubious reasons; the banks just need the weighted average of borrowers to pull through to avoid problems. The difficulty with analysing this risk is that borrowing could show up in a number of contexts. Households borrowing to buy crypto-currencies will have their debt show up on bank balance sheets and various securitisations. Fixed investment could show up as vendor financing, and the equipment manufacturers then borrow to finance their receivables. Utilities seeing demand from mining may over-extend borrowing. Firms backstopping the margin borrowing of crypt-currency exchanges would require financing themselves. At present, it appears that the bulk of transactions in crypto-currencies are related to speculative activity, as well as a core amount of activity that needs to take outside the formal banking system (illicit activity, evasion of capital controls, transactions in high-risk developed countries). None of this will directly contribute to measured GDP in the developed countries, and so any disruption to crypto-currencies would have negligible effect on global GDP. This could change. In addition to the development of new crypto-currencies, developers are working on layers that will sit on top of the Bitcoin transaction system -- notably Lightning. The idea is that less computationally-intensive means will be used to track small transactions, and then the transactions are settled on the blockchain. I discuss Lightning in an appendix. In summary, I do not see there being much take-up of Lightning by a wider community in the developed countries, unless there is an associated "killer app." It may be possible to develop a new payment platform that uses Bitcoin under the hood, but its administration would be largely centralised. Whether regulators would allow such a system to integrate with the regulated banking system is unclear. The priority of Bitcoin developers is to avoid state control of financial transactions, an attitude that is not going to help gain clearance. In other words, crypto-currencies could disappear off the face of the Earth, and there would be no measurable disruption to legal retail sales in developed countries. Furthermore, this should not be expected to change any time soon. However, there would certainly be disruption to the dark web and possibly some developing countries -- but this will have little effect on measured global GDP. Other than gambling on Initial Coin Offerings, crypto-currencies will have almost no impact on financial services. (Whether blockchain technology turns out to be useful is another question.) The technical details of managing transactions is not the major problem facing financial institutions, rather it is the management of credit risk and compliance with regulations. Crypto-currency designers have essentially followed a rather primitive view of money: that commerce is conducted by carrying around sacks of gold, or the electronic equivalent. Such an understanding of money might be useful in a video game economy, but not so much in the credit-based real world. Real world transactions are not merely anchored by trust; the threat of legal action also backs up agreements. Designing protocols that cannot be enforced in the courts is useful for drug dealers, but not so much for multi-national corporations in the developed world. In the 1990s, there was a great deal of research into the "wealth effect," which suggested that increases in wealth magically resulted in increased GDP growth. This analysis was a classic example of confusing correlation with causation. The design of crypto-currencies means that changes in their market capitalisation will have very little effect on measured growth. From the perspective of the fiat-denominated real economy, transactions in crypto-currency are negative-sum trading between participants. (Negative-sum since there is an ongoing cash flow to energy producers that power the system.) The fiat currency flows received by some participants are balanced against the outflows of others. The effect on the fiat economy is the difference in the propensity to consume between the buyer and seller. If the seller is buying a Lamborghini, and the buyer is diverting savings into crypto-currency, this would have a stimulative effect on consumption during the expansion. However, the key is that this effect is entirely the result of the cash flow, and is not related to the total market capitalisation of the crypto-currency in question. The difference from other assets is that those other assets are generally viewed as acceptable collateral for borrowing. During a housing boom, households borrow to finance new construction or renovations. This creates a net injection of cash for the parties doing the construction work, as well as suppliers. In the post-1990 era, households will also use home equity lines to fund consumption, and in the United States, can refinance to take out equity if interest rates are lower (which they generally were). Even speculative equities can be used as collateral; insiders would lock in stock values with a collar, and use that as collateral. However, since most crypto-currencies are designed to evade the law -- including commercial law -- they are worthless as collateral. Only the most gullible Silicon Valley banker would lend against such collateral. Of course, there will be indirect effects on the economy. Some goods and services are purchased using crypto-currency, and the seller willing to hold crypto-currency as payment. This generates a real economy transaction without any fiat currency changing hands. However, given the attitude of most crypto-currency users towards law enforcement, it is highly likely that none of the associated activity would have shown up in the measured national accounts in the first place. In any event, it is unclear whether the magnitude of illicit activity will be greatly affected by the market capitalisation of the crypto--currencies. The wealth effects would show up more if there were a way for financial market participants to directly invest in them (via ETF's, for example). In such a case, it is easy to see many of them destroying epic amounts of capital, which would become a drag on growth as a result of the need to raise savings to restore retirement assets. Absent the large flows from the financial markets, the net transaction flows in crypto-currencies are dwarfed by the leverage cycle in the real economy. In the near run, the macro effects of crypto-currencies is going to be non-measurable for the developed economies. Of course, there are always micro stories to tell, and one might see effects in the economic data for smaller jurisdictions. That said, the crypto-currency marker is growing exponentially, and we might start seeing spillover effects. The real damage would be from a general collapse in animal spirits in the information technology sector. A development version of Lightning is up and running. As an immediate disclaimer, I will note that I am hardly an expert on Lightning; the following discussion is based on primers I have seen elsewhere. In any event, it is likely that some of the issues I discuss will be addressed by technical changes to the protocol (such as the possibility of netting). The current design envisages a web of Bitcoin holders ("nodes") that set up transaction channels among themselves. If a user wants to transfer Bitcoin to another and they do not have a direct channel open, the protocol aims to find a connection through the web of existing channels. This means that retailers have an added working capital need: they need to finance the collateral that they are posting. To top it off, the collateral is Bitcoin-denominated, and they are borrowing in fiat currency. Although there are costs associated with setting up a credit card payment system, firms do not need to collateralise the channel. The next issue is that a retail firm needs an open channel at all times. For example, if you are a restaurant and advertise that you accept Lightning payments, it would be extremely awkward if it turns out that you cannot process the payment after your customer has paid the bill. Directly connecting to random customers may pose unknown legal risks (what if they turn out to be involved in money laundering? ), and you are tying up working capital on a channel that may not generate any other transactions for a long period of time. Connecting to your 14-year old cousin's computer is not necessarily going to be a reliable payment channel; his parents might have grounded him and taken away his computer rights for a week. Opening a lot of channels to cover this disconnection risk blows out your working capital needs. The working capital needs are exacerbated by the fact that the opening and closing is an on-chain transaction. On chain transactions take a variable amount of time to settle. You would need to open a new channel to replace a closing one before it settles, which effectively doubles the working capital requirement. If it takes two weeks to economically close the channel, you end up having to collateralise more than two weeks gross revenue. Compliance with sales tax (VAT) laws raises another problem. A retail firm needs to add the tax payment to the sticker price of the sale, and that tax payment is accrued as a fiat currency liability immediately. These firms have no choice but to use local currency-denominated accounting, and cannot afford a large slippage between the exchange rate used in the transaction and the exchange rate used for fiat currency conversion. The Bitcoin futures are not helpful. The firm is exposed to basis risk and trade execution risk (i.e., they sell their Bitcoin at a relatively low value). The need to post collateral and variation margin for the futures exacerbates the working capital requirement. Furthermore, retailers would be sitting ducks if they tried executing their trades to exit Bitcoin during the holiday period. Another issue is the question of delegation. Real world brick and mortar retail firms have to delegate transaction capabilities to employees. The payment system used cannot allow employees the ability to pay in Bitcoin in an unrestricted manner, as otherwise the employee could clean out the channel in an anonymous fashion. All of these factors point towards an obvious solution: a firm that sells Lightning payments processing to brick and mortar retail firms. The payments processor will deal with all the technology and exchange rate issues. Although this appears to be the logical solution, it raises some issues. Firstly, the payments processor will need to send fiat currency payments to the retail firm. Why will existing payments processors cooperate with this process? Secondly, such a firm would be centralised, and obey the norms of commercial law of the jurisdiction. Bolting such an entity on top of a framework designed to support illegal activity is going to be interesting. Finally, the payments processor would need to have enough fiat currency-denominated capital to be a credible commercial counter-party to retail firms. Although raising equity capital might be easy, the credit markets will be far more difficult to deal with, as they will want to see assets that have salvage value in the case of insolvency. That said, there are large economic interests in favour of the creation of such payment processing firms. For a large holder of Bitcoin, the lack of a credit system means that holdings are essentially immobilised, and not useful for any economic activity. However, these holdings could act as the source of collateral for the Lightning nodes. Since it is only used as collateral, the Bitcoin itself is not at risk (unless the system is hacked). Supporting a payments system that uses Bitcoin also acts to provide a fundamental support for the crypto-currency. (I discussed this in the final part of my series on valuation; I did not refer to Lightning specifically, but it is just providing a means to support the generic transactions I described there.) Unless there is something that derails the momentum of the project, the rise of such payment processing firms seems inevitable. On the consumer side, most household are not crypto-currency holders. They will need a way to interact with the Bitcoin economy. The natural fit is to set up a channel to an entity that connects it to an exchange, so that fiat currency can be converted to Bitcoin. The issue is that the payments would most likely be done with a credit card. From the perspective of such households, a Lightning payments channel is like a credit card that has to be prepaid (in other words, a debit card), not widely accepted in the developed countries (yet), gets no rewards from usage, has no protection against fraud or hacking, and has to be paid off with a normal credit card. What is the value proposition versus just keeping the normal credit card? That said, it might be attractive for travelling, particularly if going to a country where Lightning is commonly used, and other payment systems are sketchy. Until these economic issues are dealt with, the network will remain a niche gimmick for crypto-enthusiasts in the developed economies. It would be possible to work around these technical and economic issues, but it would take time for that to occur. This means that retailers have an added working capital need: they need to finance the collateral that they are posting. To top it off, the collateral is Bitcoin-denominated, and they are borrowing in fiat currency. Although there are costs associated with setting up a credit card payment system, firms do not need to collateralise the channel." I don't get this. Say you are a restaurant. You want to offer clients the ability to pay using Lightning. Why would the restaurant have to post collateral to *receive* payments? I understand the need to post collateral to *send* payments. It's like pre-funding a charge card. But pre-funding in order to receive payments just sounds odd to me. You have reminded me to put in a note that this is my guesstimate of how it works based on primers - which were written by blockchain enthusiasts, who don't pay a lot of attention to real-world economic concerns. Yes, it might be possible to allow for a one-way channel. Since the system is set up with "smart contracts," the contract can presumably be modified. In that case, it would allow for a one-way flow. It also makes it impossible to access revenue from the channel before it is closed. If the channel is two-way, you could try sending Bitcoin out through the client's channel to an exchange (up to the amount of revenue) in order to get fiat currency before the channel closure. Otherwise, you need to wait. Either party can unilaterally close the channel (I believe), but you probably do not want to anger your customers by closing channels early. In any event, you will need to open a channel to a firm that guarantees you access to an exchange, and that channel has to be collateralised. They talk about unidirectional channels. Yes, I saw your tweet. I would need to re-read, but my understanding is that “version 1.0” is bidirectional channels. They want a web of connections, that are not easily blocked (“censored”). Someone might create “version 2.0” that allows unidirectional channels that link into the “web” in order to avoid the problem I outlined. Have you seen this Brian? What the lightning network is, is ... a bunch of crypto-banks offering payment clearing. Frances Coppola had a discussion of this on “Coppola Comment”. I think there were some technical issues with the article you linked. The issue is that these are not “banks”: there’s no credit relationship, beyond some legal risks that arise out of commingling funds. (Frances Coppola discusses this.) Although that makes the system “safe” (other than hacking risk), the payment network is going to be stressed out by large payments going through. Would it survive Boxing Day? The issue of hacking is pretty serious. Crypto-currencies push all the security risk onto the user. If you are a cyber-criminal or IT geek, this might not bother you. But the prospect of a lot of normal people running a financial network on their home computers using out-of-date security systems would be a hacker’s dream scenario. If you just skim a small amount, a lot of people might not even notice their system was compromised for years. They emulate the payment clearing bit that private banks currently do. ISTM that banks retain payment clearing so they have a hostage over the system. About the only sensible proposal from Positive Money is to remove clearing from the commercial banks and centralise it in some way - so that commercial banks are only agents with a marketing skim rather than principal. Perhaps the Open Banking initiative will move things that way. When the Bank of Canada wants to scare bankers, they point out that they can take over the payments system and let the banks die.